Electronic countermeasure pods are no longer reliable source of information, so anyone who says the radar has identified a SU-25 aircraft in the MH17 tragedy is trying to mislead people, Gordon Duff, senior editor of Veterans Today newspaper, told RT. RT:Though the preliminary results of the investigation into the crash of Malaysian Airlines flight MH17 over Ukraine won't be known until July new theories of what happened appear every day. One claim is that the Boeing was brought down by an SU-25 fighter jet. But its chief designer has now told German media that's impossible, because it can't fly high enough. What do you make of that? RT:Do you agree with the statement that "many more factors indicate that the Boeing 777 was hit by a ground-to-air missile that was launched from a Buk missile system"? How much technical expertise would it take to fire a Buk launcher? GD: We’ve looked at this. I had an investigating team, examiners, which included aircraft investigation experts from the US including from the FAA, the FBI and from the Air Line Pilots Association. I also had one of our air traffic and air operational officers…with the Central Intelligence Agency look at this. And one of the things we settled is that in the middle of the day if this were a Buk missile the contrail would have been seen for 50 miles. The contrail itself would have been photographed by thousands of people; it would have been on Instagram, Twitter, all over YouTube. And no one saw it. You can’t fire a missile and on a flat area in a middle of the day leaving a smoke trail into the air and having everyone not see it. There is no reliable information supporting that it was a Buk missile fired by anyone. And then additionally we have a limited amount of information that NATO and the Dutch investigators have released, forensic information, and that is contradicted by other experts that have looked at things. We don’t have reliable information to deal with but the least possible thing, the one thing we can write off immediately - it wasn’t a ground-to-air missile because you simply can’t fire a missile in the middle of the day without thousands and thousands of people seeing it and filming it with camera phones. However Dr. Richard W. Bloom, director of Terrorism, Intelligence, and Security Studies at Embry-Riddle Aeronautical University in Prescott, Arizona, suggests quite the contrary. In his opinion with the facts we already have on MH17 one would quickly come up to the conclusion that it was a surface-to-air missile responsible for the crash and the only question might be who exactly was involved in launching the missile. RT:New theories about what happened to MH17 plane keep appearing though the results of the investigation into its crash won't be known until July, why is it so? Richard W. Bloom:…Virtually all security experts and aviation security experts believe a surface-to-air missile was responsible for the explosion of MH17. But we live in a world of globalization where because of telecommunications just about anybody can advance a story, transmit a story, keep a story going and we are getting to a point where even if you have a random sample of people and you ask them a question at 12 noon whether the sun was up or not some would say yes and some would say no. But more specifically to the aircraft that you mentioned, usually it’s used in an attack mode and both because of its terminal altitude it can usually operate in and because of the kinds of weapons that it usually carries, it’s really beyond a remote possibility. 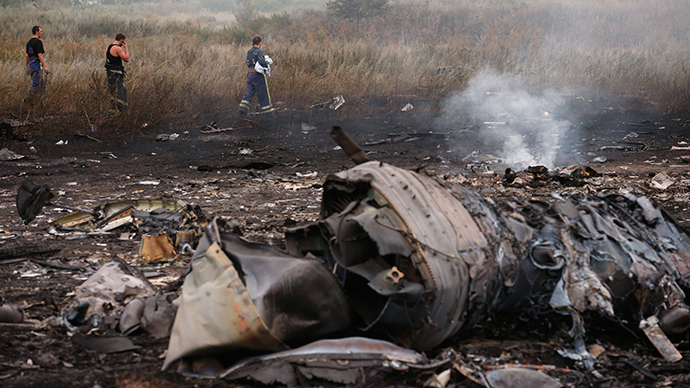 It’s very unlikely that it has anything to do with what happened with MH17. RT:So why does controversy still take place? Why there is still no clear answer to what happened? RB: If it were purely an issue of safety I think we would have a report, there would be little story to communicate or transmit to people. But because there are security implications, it happened in the area that was a de-facto war zone and many different people have political and military purposes in getting people to believe that there is still controversy about what happened, I think it has a lot to do with the fact that the story is still not going to be put to bed, that people are still advancing different points of view. Again among the aviation security experts there is really little to argue about and briefly I’d like to point out that at the University I work at it, Embry-Riddle Aeronautical University, we actually train our students for security and safety investigations and we would feed them information about the situation, they would have to come up to a conclusion. I think with the facts we already have on MH17 they would quickly come up to a conclusion that it was surface-to-air missile and the only question might be the specific individuals involved in launching the missile. RT:Most Western media assumed from the outset that the anti-government fighters were responsible. Why is that, considering that the official investigation is still underway? RB: Quite frankly throughout history there is a term I’d like to use and it has great implications and bad implications. And the term is propaganda. Throughout history people have a vested interest in getting others to believe one version of a story as opposed to another version regardless of the facts at hand, or the facts at hand can be manipulated or exploited or distorted in some fashion. Especially when we are dealing with security issues in a de-facto war zone and advance what is going on from a political and a military point of view today for example in Ukraine, it’s very understandable why there are still different versions of the story.